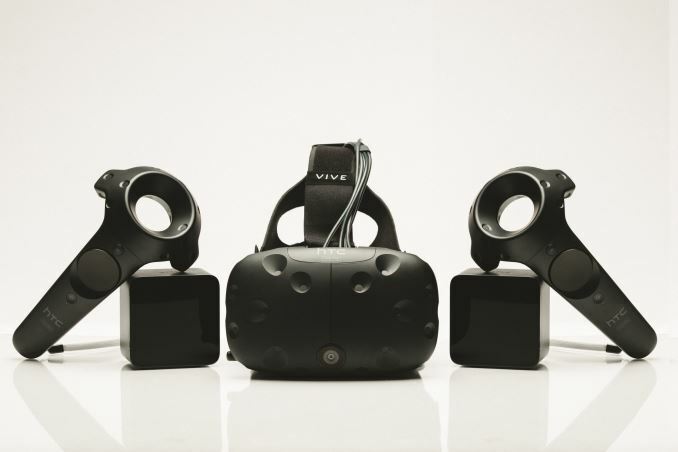 Today HTC confirmed both the release date and price for the HTC Vive VR headset. Vive has gone through a couple of delays at this point, with an April release date being stated back in December of last year. Not only has the April date been solidly confirmed this time, but the other key unknown, the price, has also been confirmed to be $799. At first glance, a $799 price point seems awfully expensive. However, HTC and Valve are marketing the Vive as the "full experience" and note that the $799 package will include the headset, the two lighthouse base stations for room tracking, and two controllers. In comparison, the Oculus Rift does come in significantly cheaper at $599 for the headset, but the controllers for the Rift have also been delayed until the second half of 2016, and they will be an additional cost on top of the $599 price. With the Rift coming out in March and the Vive in early April, consumers looking to be early adopters of VR are going to have to decide on whether they think the additional $200 up front is worth it for the additional hardware that the Vive includes, or if they'll be betting on the Rift and waiting for its special controllers later in the year. Of course, on top of the cost of a VR headset is the cost of a PC powerful enough to drive it. Valve is recommending that users have an NVIDIA GTX 970 or an AMD Radeon R9 290 at minimum. With that in mind, differences in cost on the order of a couple hundred dollars may be less significant than they seem when comparing the headsets themselves. The countdown on the HTC Vive product page is now just under 8 days, and when it gets to zero preorders for the Vive will open to the public. On top of the headset, base stations, and controllers, for a limited time those who purchase the Vive will get Job Simulator by Owlchemy labs, and Fantastic Contraption by Northway games. Yeah but look at the game list.. How many of those developers have you even heard of? Even if HTC goes under, valve owns the technology, they are licensing their setup to any oem who wants to make them. HTC just has the 1 year exclusivity.